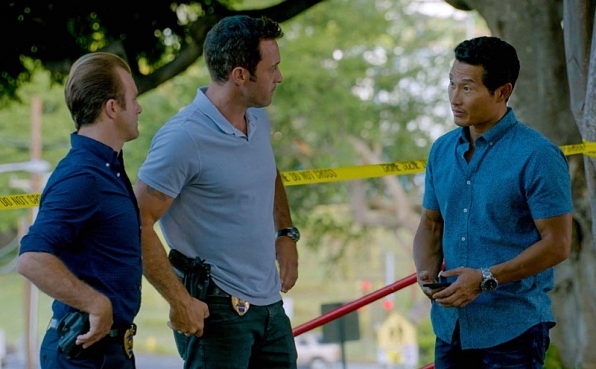 With Kono and Adam on the run, what happened with the team back in Hawaii? 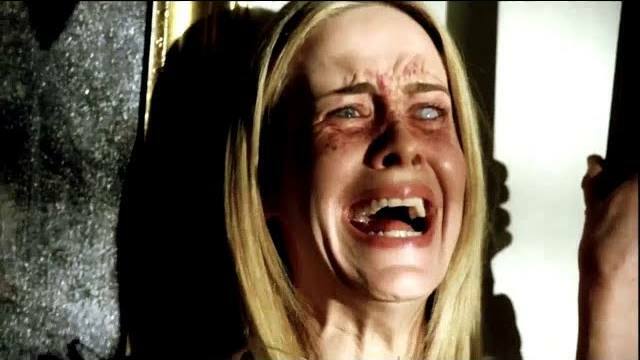 What happens to Steve and Catherine as well as Wo Fat? I may have been on the mend this past season but don’t worry. I’m back!!! Here’s a recap of last season. Also a special treat, every start of a new season the cast and crew of Five-0 have an annual blessing before shooting. Here’s a look courtesy of The Honolulu Star Advertiser. Hart of Dixie Casts Superman? 5 years and 100 episodes later who knew they would make it this far…I did but who’s complaining? Well, the episode starts at the very beginning of the series when Steve is transporting a high level fugitive Anton Hesse. When their convoy was attacked by a missile. As Steve tries to protect the hostage he grabs a gun and shoots at Steve. He fires back but lands on barbed wire and dies. 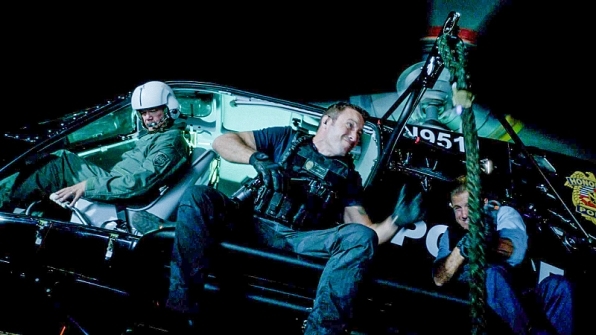 When Steve gets a call from Anton’s brother Victor he has his father taken hostage when shots are fired. The line went dead until the line was picked up by Danny? That’s not how the story started. It seems that Steve was dreaming as we find him in a room enclosed. Where is Steve? Well the team is tracking him down with the help of Sang Min (Guest Star: Will Yun Lee). He meets with Johnny Moreau (Guest Star: Gavin Rossdale) to find out what he’s been up to. 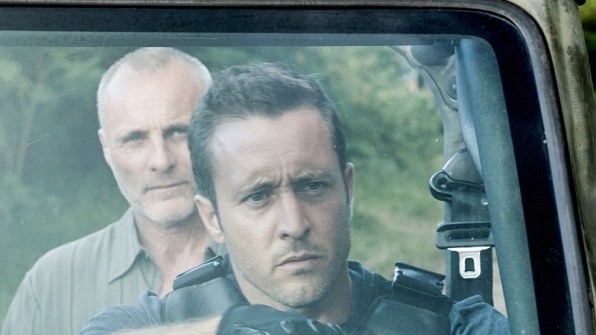 When Danny gets a call from HPD they find Steve’s car abandoned and was taken. When we get back to Steve the room darkens and a projector activates to reveal an old family memory of Steve’s. Until the room fills with gas and knocks him out. Wo Fat tortured Steve for information about his father in which he has no information about this. But it made things worse as something incredible is revealed. Steve and Wo Fat are brother of the same mom. Back at Five-0 HQ Sang Min helped the team find an associate who might know a thing or two about Steve’s abduction. Kono pays a visit to her boyfriend Anthony Noshimori to ask him about a man named Anthony Shue in connection to his father Hiro Noshimori. So at this point Wo Fat is still putting him through various tortures and having him see snip its of his life as well as the continuation of his alternate life. 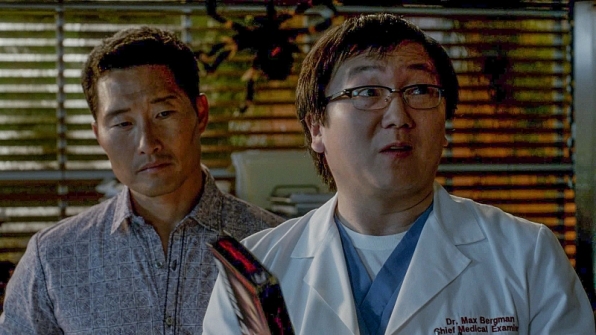 Even on the alternate universe Wo Fat died and the team well…never got made. 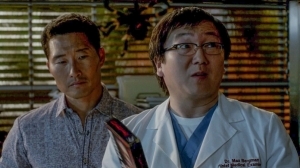 Well Wo Fat seemed convinced and when he leaves Steve escapes and takes down the doctor. Wo Fat returns and takes on Steve when the Five-0 team finds both of them with the help of Adam’s Intel. When they find him they are both on the ground. 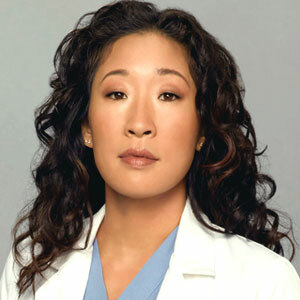 But Steve was still alive and Wo Fat…dead. The episode ends with a backtrack through the timeline and the formation of the team…good times. Happy 100 to Five-0 and here’s to many more. We’ll see you in two weeks!!! In the last few weeks we’ve seen Jerry investigate a money counterfeiting scam in Hawaii linked to a book store owner. Last week we saw Jerry get captured by those same people. 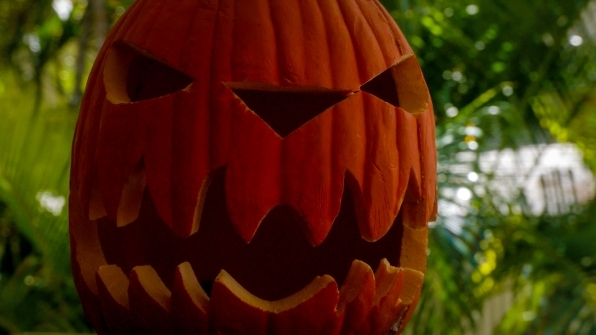 Well fast forward to Halloween…actual last Friday and we see Thomas Farrow, the man who Jerry was investigating hurting both him and an unknown man before he got shot. Farrow asks Jerry what he told Steve. Well not long after Jerry was released and went to HPD, where he would only talk to Steve and Danny. When he got there he told them about getting captured and seeing a guy get shot which we find it was an associate of Farrow’s. It seems there’s a bigger plot going on about getting money off the island. 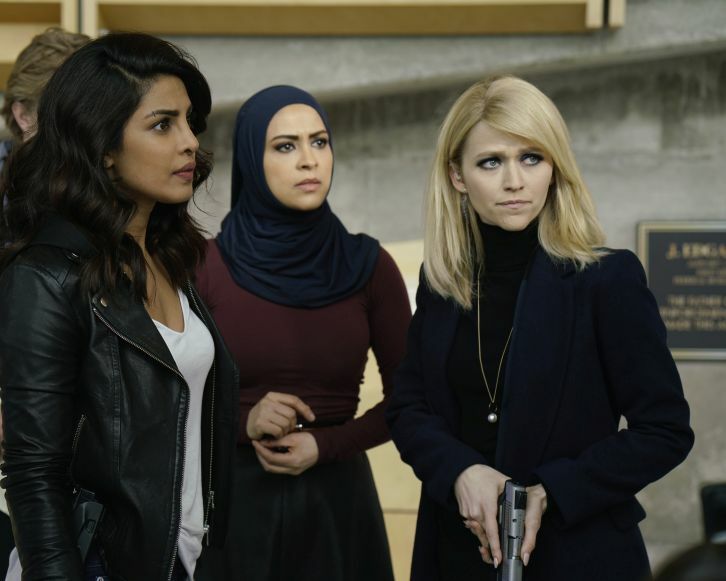 So with the help of Steve’s new friend Ellie she tries to grant Five-0 clearance for a warrant. Later request denied but Steve and Danny go in for the hell of it and to see if they can find anything. Steve found scars on his arms which would suggest combat. So he has HPD surveillance set up for any leads. With that the they stop him at a facility where they apprehended him again but came up empty…again. 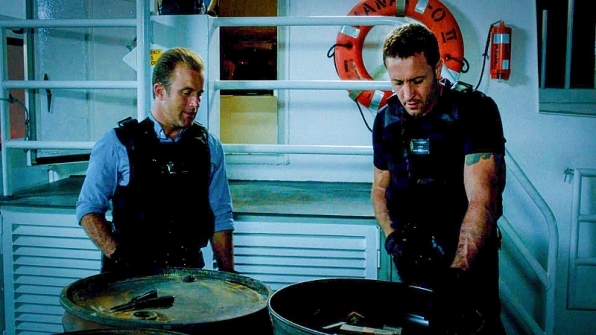 While interrogating Farrow Steve mentions the scar on his arm. But Farrow lies and tells him motorcycle accidents. Yeah right, well Ellie stops by a Five-0 to find out what’s going on with the investigation but tells them of the number of donations Farrow gave to politicians. It wasn’t until Jerry almost spilled the beans on their operation that she finds out what’s going on…well almost. We find out that Farrow isn’t Farrow, instead he is a former British special forces Major William Corrigan. His team was on a mission in Iraq when they were accused of the death of a family. One of his men Colin Helms was the guy he shot dead earlier in the episode. But it turns out he was not dead it was a ploy to get the money out. Jerry got information linking the Irish Republican Army and one of the freighters and Corrigan. When they find the freighter they find not only the money but Helms as well. When all was said and done they take Corrigan back to Britain. While that was going on Chin and Lou head to a very frozen crime scene with someone hanging, multiple stab wounds and his tongue cut out. Later another victim stabbed the same way but eyes were taken out. The two cases are similar and Max was able to know who the killer was. He refers to a horror film where three victims were killed with a sickle and has their tongue, eyes and ears were cut off. Which matches to hear no evil, speak no evil and see no evil. Meaning that they are looking for a third person. So Kono and Lou visit a video store to see if anyone borrowed the film recently and he said no. But the store did host a film screening and they looked up invite list. Chin had a different angle as he knew the victims as classmates of Kamakona. Well turns out that the victims were bullies back then and now someone is after the final victim Brad Weiss who was the ring leader. However when HPD tried to warn him they he was captured. We find him in his backyard slashed and his ears cut but still conscious and the killer on the run. When they talked with Weiss he tells of a time in his senior year where they picked on a kid named Sam Cole. It wasn’t until a few years ago where Weiss saw Cole and saw his had shaking. Lou, Kono and Chim go to Cole’s house and find him as well as his father also cut up. The episode ends with Ellie and Steve going fishing at his place. What did I say about a beautiful friendship? Well guess what, Friday it is finally here. 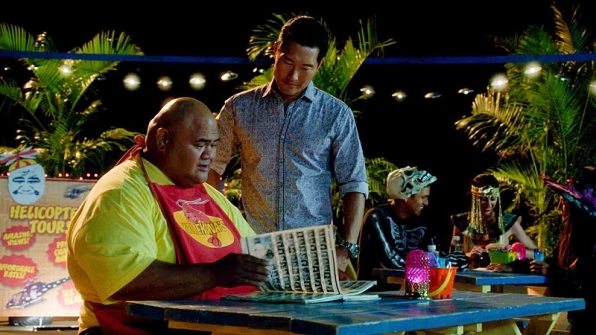 The 100th episode of Hawaii Five-0, here’s your sneak peak. 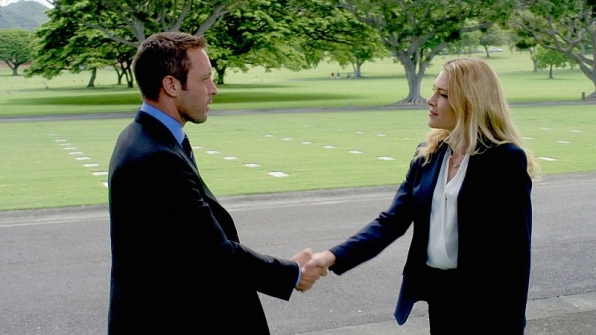 The episode begins with Steve heading to National Memorial Cemetery of the Pacific to visit his father’s grave. 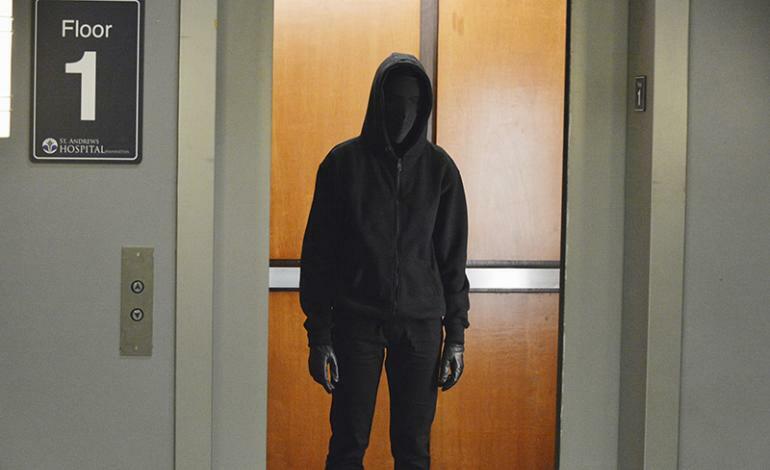 Which in the series premiere almost 5 years ago his dad got shot by Victor Hesse, one of the members of Wo Fat’s gang. Well, not long after another mourner stops at McGarrett’s grave. Steve becomes curious meets the woman known as Ellie Clayton who seemed to know Steve’s dad back in the day. Reason being is that his father was investigating a case involving Ellie’s father murder. John would also check in on Ellie on the anniversary of his death. But she would visit his grave site on the day he died almost four years ago. Now it just so happens that his son would meet this girl. Here’s the best part, she’s also a deputy prosecutor. Well it seems Steve might have a connection to her after all. 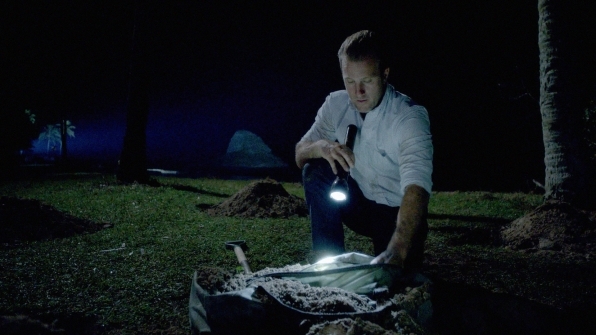 Since the beginning of the series he has been holding on to his father’s tool box with various items of evidence. One piece was from the bar that Ellie’s father owned. Before he died John worked with Chin at HPD so Steve consulted him for what he knows about the cold case his dad was working on. Ellie gives us a flashback of what happened that night from doing homework to the shots fired in the bar. 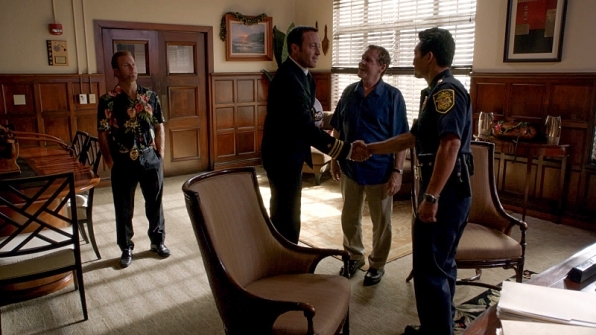 To meeting John McGarrett (Guest Star: William Sadler). Back then John had a possible lead on a homeless man named Ned Burrows. He had been tracking him since the case and got nowhere. However thanks to a program in Hawaii that gave homeless people a license and a job they were able to find Burrows. When they find him Burrows told Steve and Chin that when he got the sweater from the dumpster he found a metal box with money and a watch. Steve talked with Ellie to see if there was anything out of the ordinary the days leading up to his father’s murder. She said that he was talking with a boy named Jordan Lewis in which her dad got into an argument with a week before he died. When they met with Jordan at the correctional facility he mentioned how he was learning to get off drugs thanks to Ellie’s Father. Hence why they were arguing. But digging deeper into the past Chin remembers Christmas 15 years ago when John was visiting Ellie and regretted sending Steve away after staging his mothers death. Something Steve has been holding on to for a while. Well it turns out that Ellie’s father may have been caught up in a gambling ring that might have costed his life. Steve and the crime lab opened up the autopsy report again to see what they might have missed. After the reports it seems that there was a connection between Paul Clayton and Tony Malua’s gun. But he gave his gun to a guy named Jimmy Sykes the killer. So Steve and Chin consult Jordan to help catch the killer and it worked but he got shot by Clayton. Ellie makes a visit to Steve’s house to thank him for finding the killer. It almost looks like these two could have something going on. I mean now that Catherine is gone who might be his new love interest? Well remember Jerry’s hunch on the counterfeit book seller? Well he just got made! Now what happens from here? Your exclusive sneak peak is down below.